As the crowds clear in Charlottesville so must our view of who is responsible for the current state of our union. The rabble has quieted and so should our minds as we focus on the core issues that face our great country. The problematic lack of tolerance facing the U.S. is not a just a "social issue." The GOP's congressional leadership's failure to adjust to our nations now permanent diversity can be found at the heart of the country's most fundamental problems. Consider that the GOP worked for eight years straight to thwart any progress by the nation's first non-white President while being cheered on by the constituencies of intolerance. 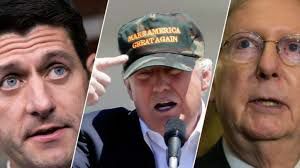 Instead of working to create a framework to move important initiatives forward during the Great Recession the GOP, afraid of a hate radio backlash, refused to cooperate with Barack Obama. The GOP's scorched earth policy has created the lack of a serious approach to real economic growth and the modernization of our health care delivery system. These two factors created historically stagnant wages and an opioid epidemic that has harmed the GOP base as much as any other. But like a corrupt cop, the GOP had a black guy to blame for their crime of neglect and continually planted false evidence indicting the former president for it via right wing talk radio and Fox news. Now this weekend Sen. Cruz, Marco Rubio and others who abandoned their duty and benefited from the racist dog whistles are concerned that the weeds of hatred now occupy their fields. The equivocation by Speaker Paul Ryan on addressing the worst xenophobic elements of his caucus and his out right lies on the economy and healthcare, designed to please those elements, have created room for avowed racists to use the ensuing populist frustration to gain ground in our national discourse. Yes, the President is to blame for inspiring the worms of hate, but the GOP leadership must take responsibility for scorching the earth that allowed the slithery creatures of intolerance to thrive.